With HappyFox Advanced Search option, staff can search for tickets that are due today or in the near future. This article pertains to HappyFox Classic Search feature. 1. Today - Displays all the tickets (that the staff has access) that are due today. 2. Tomorrow - Displays all the tickets (that the staff has access) that are due tomorrow. 3. Next 7 days - Displays all the tickets (that the staff has access) that are due in the Next 7 days excluding today. These options can also be combined together like "Today,Tomorrow", which will display all the tickets that are due today or tomorrow. If you are an advanced user, you can directly use the search bar to search for tickets with following "duedate:" keyword. Below is an example of the same. 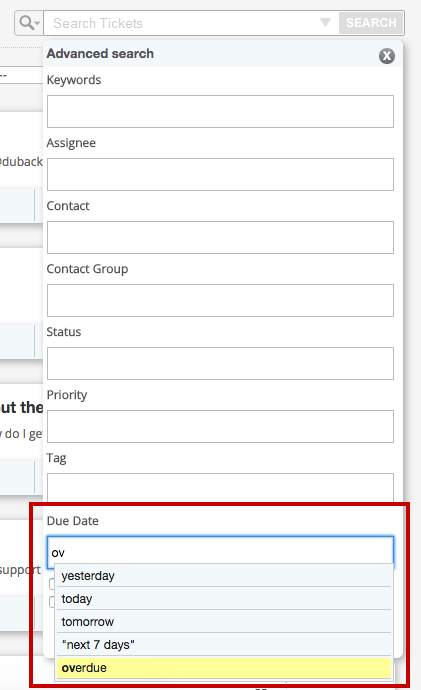 You can use due date option like other options under Advanced Search and also save the search with due dates. Since all the due dates are relative terms, your saved search will always give you contextual results.